How long does it take to remove electrons from noble metal surfaces and what processes govern the underlying dynamics? Photoemission, i.e., the removal of electrons from matter through interaction with of light, is a ubiquitous and fundamental process in nature. While the energetics of photoemission is very well understood and finds wide application in various spectroscopic techniques, the underlying dynamics have only become accessible with the advent of attosecond science. Due to their inherent complexity, only few attosecond time-resolved experiments involving solid-state samples exist to date. Early experiments aiming at temporally resolving photoemission from solid surfaces have indicated that the process unfolds on time scales that are dominated by the ballistic transport times of the electrons from the bulk to the surface. In a NCCR MUST collaboration between the Hengsberger/Osterwalder group from the University of Zurich and the attosecond science team from the Keller group at ETH Zurich, we have successfully extended an interferometric attosecond technique (RABBITT, reconstruction of attosecond beating by interference of two-photon transitions) to solid-state samples. 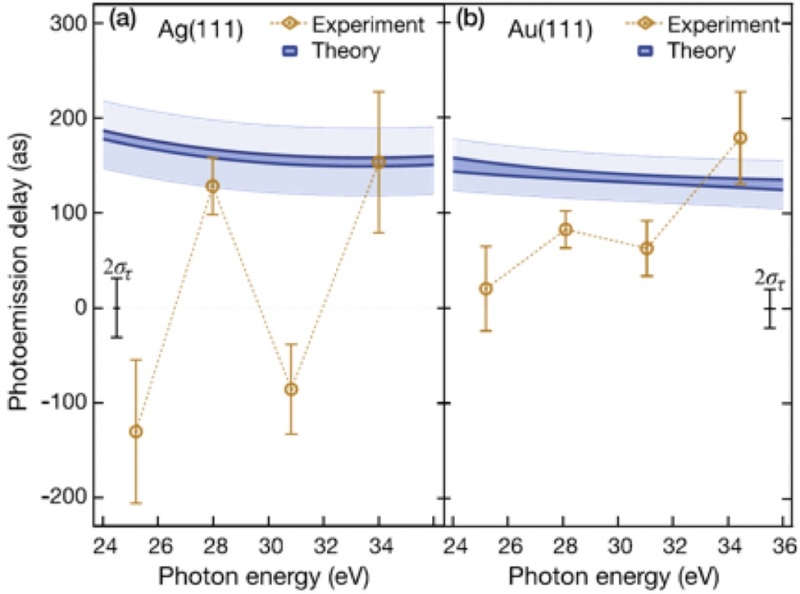 RABBITT in combination with a unique experimental setup enabled us to extract the surface specific photoemission delays for Ag(111) and Au(111) surfaces as a function of excitation energy. The energy dependence of the photoemission delays deviates considerably from the expectations based on a simple model using scattering theory and ballistic transport. The observed deviation highlights the importance of final state effects in the photoemission dynamics from solids – a contribution that was neither accessible nor considered in earlier studies. We believe that the RABBITT technique will play a major role in the advancement of attosecond science toward condensed-matter systems as it allows for studying charge dynamics at the inherent electronic timescale with less perturbation from the probe process compared to competing methods while in addition providing higher energy resolution. Furthermore, such experiments access the fastest possible response of an electronic system to interaction with an electromagnetic field and hence provide indications for the ultimate speed limits of future electronic devices. Locher, R., Castiglioni, L., Lucchini, M., Greif, M., Gallmann, L., Osterwalder, J., Hengsberger, M., and Keller, U. (2015) Energy-dependent photoemission delays from noble metal surfaces by attosecond interferometry. Optica 2, 405-410 (10.1364/OPTICA.2.000405). Fig. 1. Experimental setup. The experiment uses the unique capability of the attoline setup at ETH Zurich for simultaneous measurements of photoemission phases in two separate foci. An argon gas target serves as an on-the-fly reference and permits the extraction of the surface-specific photoemission delays from the data taken in the second focus. Fig. 2. Measured photoemission delays and comparison with theory based on scattering theory and ballistic transport. The non-monotonous behavior of the experimentally determined delays indicates the incompleteness of the model and thereby highlights the importance of final-state effects.